We can now be found in the back bar of the Knavesmire Pub where we moved in Jan 2016. We are now called “The Yorkuleles”. 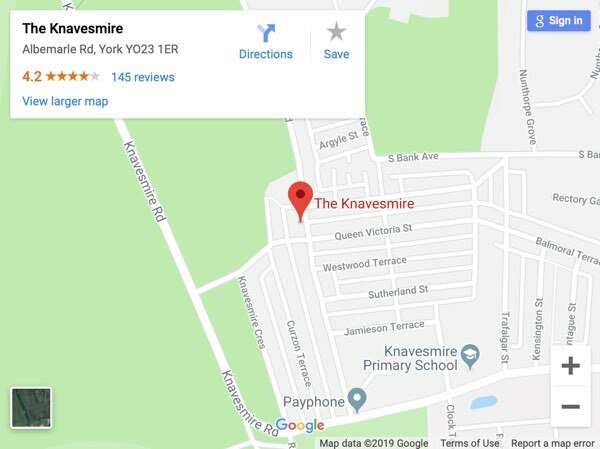 We hold our club sessions in the back bar of the Knavesmire pub in York which start at 7.00 pm on Tuesdays. Many thanks to Stuart and Rachel for providing this space for us and for making us so welcome. For the last two years we have had an open door policy on people wishing to join us or visitors from another uke club staying in York on holiday wanting to join in the fun. Although we would love to continue to welcome 'all comers' without reservation, we now have an issue with the size of the room and the number of players we can comfortably accommodate in it. If you are still interested in joining us then please let us know. If there is space in the future we would still like to be able to welcome you. There is a growing library of songs on Dropbox that can be found here. You are very welcome to bring along any songs that you think may be suitable to play but be prepared to photocopy enough copies for everyone (although most of us are now using Dropbox and tablets/laptops so a better option is to send a digital copy to Tony). Tony often makes updates during the week so it is a good idea to access the Dropbox page for the club's songbook from home before you come to the rehearsal and check that you have got each song that has an update made available offline if you have no way of accessing the internet from the club. There will be a collection of a small charge (currently 50p each week) to help with admin costs. The Yorkuleles Ukulele Club York. Saturday night was a real success and I want to thank you and the rest of the group for providing such scintillating entertainment. I was watching the audience throughout your set and they were enjoying it immensely. The whole evening was fantastic and we have received so many nice comments and many people have asked when we are doing another one! …… Thank you once again to you and the group for a wonderful evening. I saw the video on Facebook, you were all fabulous. I heard a group chatting about it in The Ferry, they said it was the best music session they had seen throughout Cawoodstock. Can’t wait for the Age Uk AGM. Tony (for anything to do with the running of the club, membership and the music). Martin (for this website and Facebook pages). Contact information, usually your email address will suffice but we may also collect your name and telephone number. The processing of your personal data is necessary for the legitimate interests of the Yorkuleles club. The list of members is kept by Tony Baldock solely and no-one else has access to the list. You are entitled to details of personal information which we hold about you. Please contact tcbaldock@gmail.com, if you wish to exercise any data subject rights. We may delete your personal data if there is no reason for us to retain it, for example, if you have not attended a club session for 12 months and we assume that you no longer wish to remain a member.